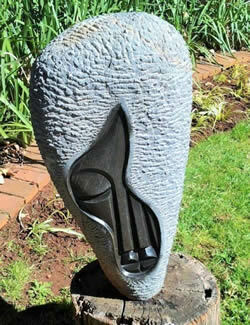 For over 20 years internationally known Africa Yarona has operated as a loose association of 15 artists. Their name means "this beautiful Africa of ours". Many of the artists will be available to speak to over weekends, and some will work from the nursery. Washington Chakanyuka (the group co-ordinator) has told me that customers can also observe demonstrations on how to maintain and care for the sculptures, as well as how to restore damaged garden sculpture. When I looked at this art, It is so quintessentially Africa, particularly Southern African, that I felt it would fit in beautifully with our indigenous plants. The varied textures and colours of the plants lend themselves well to hand crafted, organic garden sculpture. 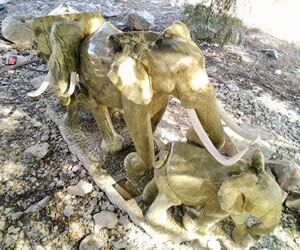 This talented group of sculptors have international appeal. In 1994 the South African Government chose Africa Yarona to represent the country in New York, at an international exhibition celebrating South Africa's independence. They have also exhibited in other places in the USA, and in Canada, Singapore, Malaysia as well as Australia. In November the group travels to BAZAAR BERLIN, to exhibit and sell from there. Many of the sculptures have found homes with prominent people, including presidents, the queen of England, and government officials from all over the world. The artists are well known for their stone sculptures, but also work in wood, wire and some branch out into paintings, including batiks. They work with various stone, including Savannah Marble (also known as Butter Jade), Wonderstone from Ottosdale in the North West Province, as well as Verdite which is sourced from Nelspruit. 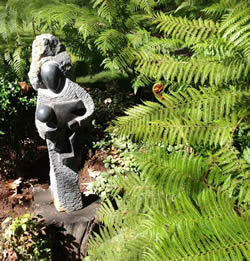 Whether collecting for your own garden or for landscapers to incorporate into a garden landscaping idea for a client, these sculptures are sure to add something special to the spirit of an indigenous garden.